Obverse: Old laureate and draped bust of George II facing left. Text around GEORGIUS II DEI GRATIA. LIMA in exergue. Reverse: Crowned cruciform shields, incorporating the Arms of Hanover, garter star at centre. Date split either side of crown. 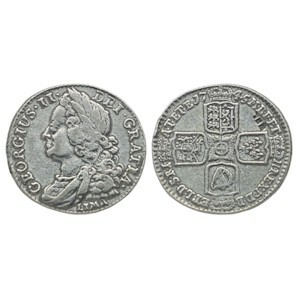 Text around M B F ET H REX F D B ET L D S R I AT ET E.
History: The word LIMA below the king's bust celebrates that this coin was made from seized treasure from the Spanish Colonies and the New World from Admiral Anson's circumnavigation of the globe, 1740-4.